It really has been a while since I did one of these. I have been trying to review a lot more games but I'm having a hard time putting words together for games like Metal Gear Solid V and Sleeping Dogs. Not that I'm lazy, it's just real life got in the way ("As opposed to the fake life, Ralphy?"). Instead of talking about another console game, let's talk about Seen by Polychroma Games, a visual novel on Android. "Seriously, Ralphy? An Android game? First, console games, and now Android games? Could you be any shittier?" If you believe that mobile games aren't "real" games but you're okay with 300 8-bit platformers on Steam, then what's it like to be wrong? Visual novels aren't for everyone, sure, but once in a while, you can enjoy them for what they are - interactive stories. Sometimes, instead of using the Fulton recovery system on unsuspecting soldiers, gamers like to sit back and enjoy something that wrenches the heart and makes them feel emotions. Gamers feeling emotions? Sign me up! So what's the story about? You play as Mark Blythe, a high school student who becomes friends with a classmate named Nicole Tyler through chat. Well, canonically, those are their names. I always have a soft spot for games that let you rename the main character. So move over Mark Blythe and say hello to Ralph Ricker, a new surname I chose because I wanted to use something else instead of Corleone for some reason. Renaming the character gave the game a more personal feel and actually drove me to finish the game. I clearly drive on my ego when it comes to video games. You can change the default photo of Nicole Tyler to anything or anyone, just to give her a decent profile photo in the chat window. Also, you're given the option to rename Nicole Tyler but at the cost of 40 coins in the shop. So of course I renamed Nicole Tyler to someone else's name that I'm familiar with but I'll still refer to the character as Nicole so you won't get confused. Blurred out the last name and part of the photo so take that, lawyers. There aren't any in-app purchases in the game however so you're only relegated to watching video ads and taking the occasional survey. The game never asks for money which is pretty humble of it. It's just the occasional full screen ad that bugs you every time you exit to the main menu. Humorously, available for purchase is a remake of the WhatsApp story "Annie96 is Typing" which is great fun for fans of that oddly creepy story. There's even a story editor that you can purchase for 100 coins, allowing you to create your own chat story, if you want to make your own version of this game's storyline. I still haven't purchased that feature so I won't be talking about it, sadly. Going back to the game, the main menu and the UI where the conversations with Nicole take place certainly look and feel so similar to a Facebook chat box that you can take a screenshot and send it to your friends, making them think that the girl who broke your heart actually sent you a message after all these years. Ha! What fun! You don't really get to type anything you want. You only press on the blank keyboard to simulate your character typing and the letters appear one by one. Basically, you're just simulating your character's finger movements since you're not picking the words he says but you're technically typing. Coincidentally, a black version of this blank keyboard called "Ninja Pro" is available for purchase on the SwiftKey app if you really want to test your keyboard memorization. 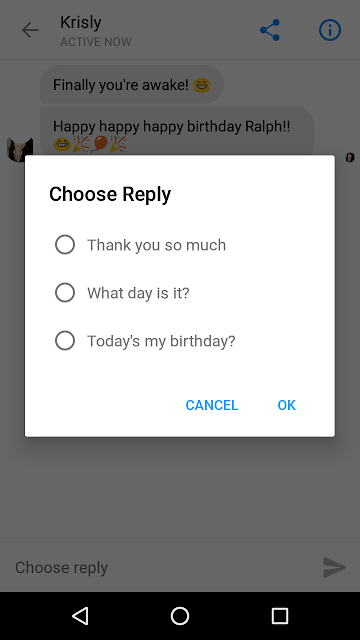 Before typing out the reply, you're given options on what to say to Nicole. In an awesome way of using the fake typing to further project emotion in certain replies, the words and sentences you type would sometimes be deleted as your character changes his mind on what to say. One part of the game has him type "Go fuc" to Nicole's ex-boyfriend before deleting it and saying "Sure" or "I'm busy". This is used in an emotional level later in the game when you can tell your character's heart is breaking and he tries his best to say the right words to a heartbroken Nicole. But he can't because he knows it's hopeless to reach out to her. And it's all his fault. The dialogue choices you make do matter in the game as it affects future parts of the conversations. There would be callbacks to earlier conversations depending on your choices which is actually a nice touch. The story gets dramatic at times, even more if you renamed the characters like I did just to twist the knife further into your intestines. It may seem cliche but sometimes the cliches work. Sometimes people like cliches because those same cliches done right are what we emotional weirdos like. One thing I like about love stories is the depression (that's something I never thought I'd say). One chapter does evoke the feeling of depression similar to what's shown in the film 500 Days of Summer. And as your character tries taking everything back, Nicole takes it to a sad route - a route without you in her life. Yet the story goes on. I do have a few gripes about this game though. First is the park scene. 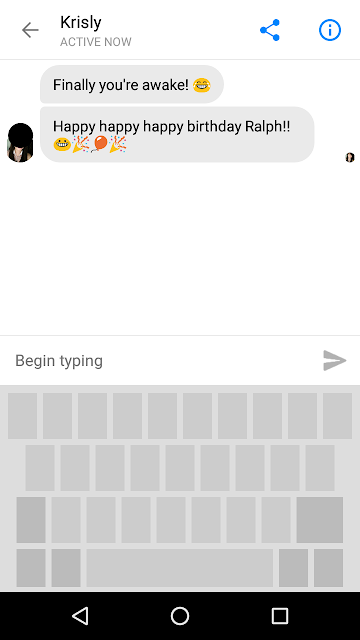 It's supposed to be a tender moment between you and Nicole but, given the limitations of the game and possibly ruining the messaging theme, conversations are still delivered in Facebook chat window with emojis. Now, maybe there are some people who add emojis to their verbal sentences - I'd like to find out how - but it does kill the mood of how this scene is supposed to take place outside Facebook even if it uses a background of a park. Just a nitpick but it's still a good scene nonetheless. There's no music at all and if there really were any (please correct me if I'm wrong), they were really forgettable. The only sound you'll remember is the fake notification sound. Perhaps if you're dramatic, you can play some background music from your phone just so the scene can play out without the deafening silence, you emotional pansy. 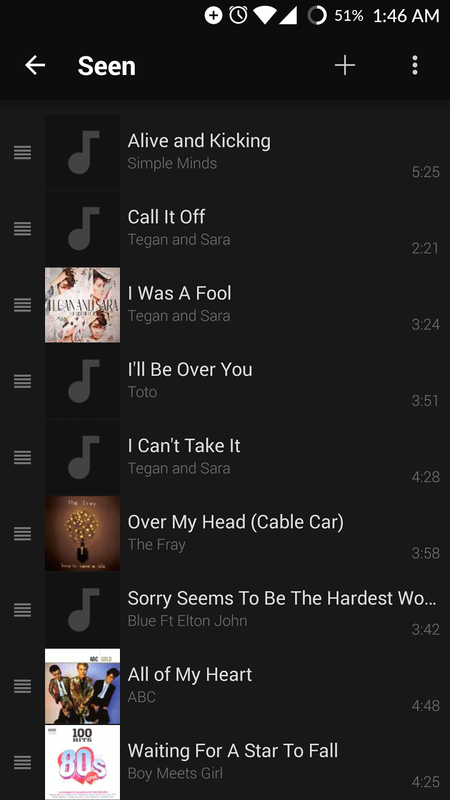 I did make a playlist of my own to have songs in the background whenever I replay the game and want to emotionally kill myself by talking to a simulation of a girl who never wants to talk to me again for no reason. You're free to use these songs as well! Enjoy the story melodramatically! "Waiting For A Star To Fall" feels appropriate for one of the endings of the game. One more thing to add. The game's main tagline is "What if life gave you another chance to learn to love again?" ...Do you ever get the feeling that one game got too real for you and it's all your fault? The game doesn't force you to change the names at all; it was an option you can actively take. Heck, you have to use fake virtual coins so it's not available from the start. 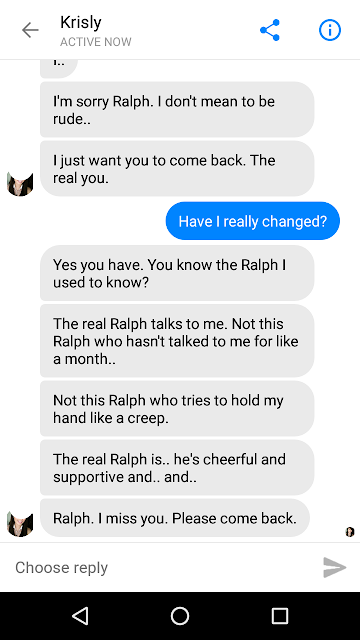 Even if it's all fake, a simulation of a Facebook chat, you wish it'd happen again in reality, considering how badly she ended your friendship. You wish she'd talk to you this way again, like a friend, like how you used to be but that friendship's long dead. She's nothing more than a regretful memory. So the only satisfaction you get is pretending she's talking to you again. Maybe you shouldn't have changed the character's name after all. 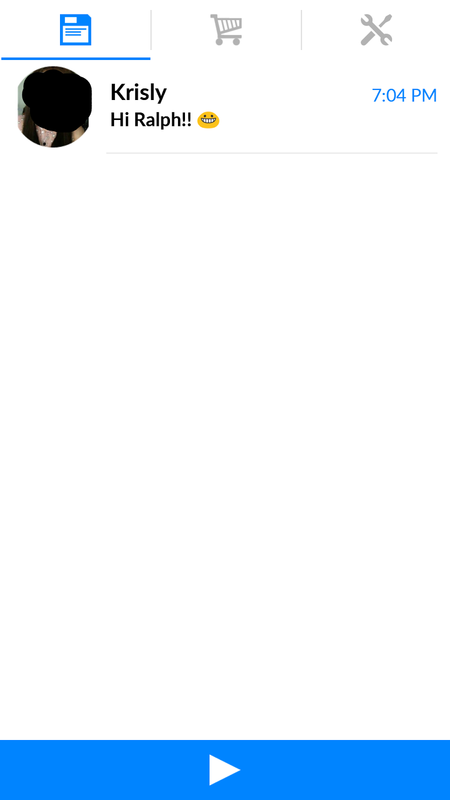 Yet you took that option because you didn't want to talk to the unfamiliar name with a generic flower as the profile photo. You wanted to talk to her just to make this story's impact more meaningful. You wish she were in your life again because of this game but she'd rather stay far from it. So you know this is as close as you're ever going to get now. Maybe in another life. Oh, uhhh, sorry. Sorry about that! That was just an example of how the game could really make you feel if you immerse yourself with the writing. Definitely a wonderfully written game. As I always ask: Is it fun? Yes. For an hour at most, you're given this emotional roller coaster of a game. "Seen" by Polychroma Games is available on the Google Play Store, which you can check out right here. Personally, I recommend watching 4 ads to unlock the option to change Nicole's name if you want to be an emotional pin cushion. It's a much better game if you add your personal touch to it. As the tagline said, what if life gave you another chance to learn to love again? Some of us don't have that chance so this is just a simulation of something we'll never have. Now if you'll excuse me, all these emotions have made me wimpy and now I have to watch more WWE NXT. I still have no clue where my life is going. Nor do I think I'm actually overcoming my depression. Haven't seen a psychiatrist since February because my old one retired so it's been totally fun. Self hatred never felt so good. Does one really just go living day by day with no clue? Or do they stop and chance something? Then again, what do I know, right?